I am wearing black today. So? Why do you want the whole world to know this? Okay! Today is Choti Diwali (a day prior to Diwali), one of the most auspicious occasions in India, and I am wearing black today. Now would you ask me the same question? Got my point? So today just without much thought, I took out a black salwar kurti from my wardrobe and as soon as I wore it a thought came. I should not wear this colour today. Then at the very next moment counter attack by my brain-Why not? What’s the harm? Then a series of questions and reasons. Are you too superstitious? C’mon ..which age are you living in? After all its just a colour. Still, I had a doubt. If we have always been told and instructed by our elders not to wear Black on any auspicious occasion, there must be some logic behind it. Logic! another belief of today’s generation that they will agree on a viewpoint only if you can explain them logically. Otherwise they have their own logic to term it as myth or superstition. Then began the process of searching and surfing in internet. Like everyone else, I also thought it will answer my query. 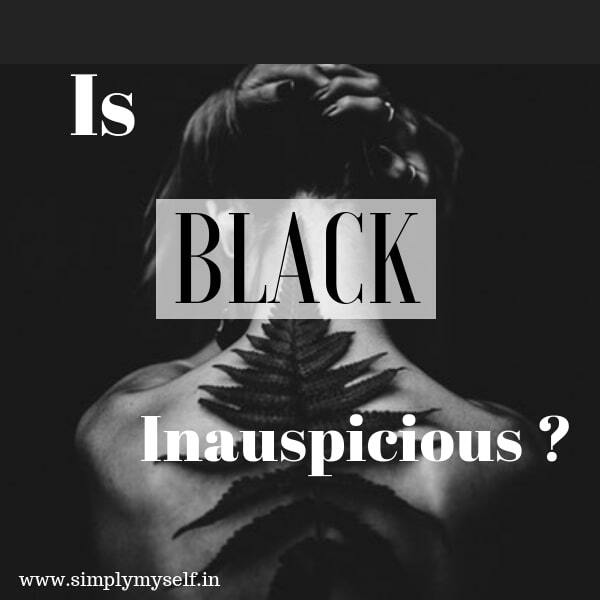 I was not surprised to come across various articles about the colour Black and its effects, all of which imprecisely explaining why or why not. In short, my query was not answered. But an interesting fact came out, India has unity in diversity in true sense. Not only because of the imbibed cultures and myriad languages but also because of the varied opinions. Every Hindu tradition started by our ancestors is based upon certain scientific theories. Yes, we should accept the fact that they were way more intelligent and logical in their approach than us. We accept some rituals while label others as superstitions due to incomplete knowledge, because with the passage of time only the rituals were propagated not the reasoning. Anyway, linking this perception to my topic, if Black was considered inauspicious, there must have been some logic( oops.. I mean scientific reason) behind it. First of all, do you know according to science Black is not a colour at all. It is actually absence of all the colours . A little bit of science now. I promise I would not start a science lecture here. How are we able to see a colour, say a red apple? Because the apple has absorbed all the wavelengths(you can read colours) of light energy except red, which is reflected .The reflected energy reaches our eyes and the energy translates into red colour by the retina. Brain interprets it and we see it. That means when all the colours are reflected by a body it appears white and when all the colours are absorbed and nothing reaches our eyes, it appears black. Thus in any auspicious occasion, whether Diwali, Navratri or marriage ceremonies, wearing black means you are absorbing all sorts of energies(good and evil both;still a confusion) and not reflecting it out. Now that may mean while performing rituals, if someone else sheds off his negative energy, which happens, it is also absorbed by your mind and body. After having churned my mind so much on good black and bad black, I finally decided, even if I wear a black outfit on any auspicious day I will avoid this colour while performing religious rituals. It is not superstition. It is acceptance of an unknown truth behind the theory of black given by our ancestors. I hope someday, I get to know the real reason, may be in an ancient book. Until then folks, I have made up my mind. What about you? Do you also prefer to avoid wearing black in religious ceremonies ? Too good article, perfect blending of culture and scientific reasoning. Best part, to my limited knowledge is – with the passage of time we propogated the rituals and left behind the logic. In this regard, the Satogun is reflected by the colour white as the same doesn’t consume any colour. Look forward to more such compositions.